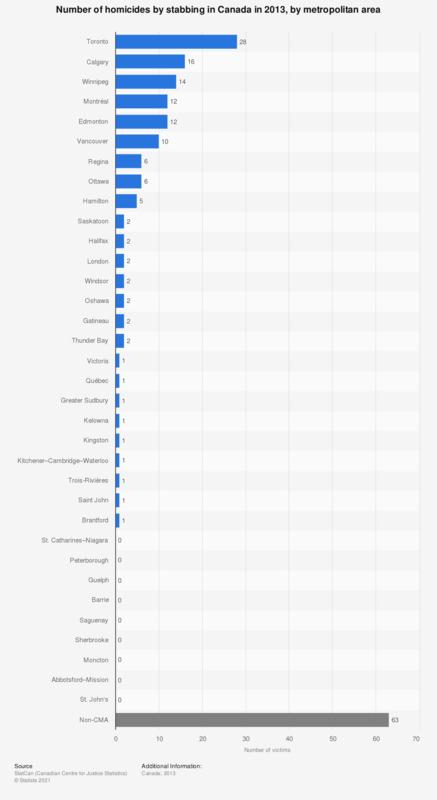 This statistic shows the total number of homicide by stabbing victims in Canada in 2013, distinguished by metropolitan areas. In 2013, the highest number of stabbing homicide victims was reported in Toronto (28). CMA - Census metropolitan area. Moncton, Peterborough, Brantford, Guelph, Barrie, and Kelowna became CMAs in 2006. * Gatineau refers to the Quebec part of the Ottawa–Gatineau CMA. ** Ottawa refers to the Ontario part of the Ottawa–Gatineau CMA.